Me Booty! – Now For Sale! By chevee | 2015/09/01 - 08:16 | 2015/09/01 Announcements, Me Booty! In 19 days, we celebrate my favorite holiday: International Talk Like a Pirate Day! Every year, around this time, I do something special. Traditionally it’s been to give away copies of Scallywags… but this year, it’s something a little bit different. Me Booty! is now for sale at thegamecrafter.com! Last year, I started a thing… each year at Gen Con (and maybe some other conventions) I will be making a new game, and giving it away. Last year, my main motivation was that I had some money leftover from my PULL! Kickstarter campaign and I felt guilty about it. I chose a game that I always wanted to release, but felt a bit weird about it because it was so similar to Scallywags, my first published design. As promised, I am not Kickstarting this game… but demand has been significant with many people who picked it up at Gen Con asking to buy more. I thought long and hard about it and decided that a year was long enough. I should share this game with the world-at-large, so here it is. If you order now, you should get it in time for Talk Like a Pirate Day! 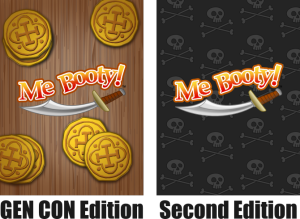 If you noticed, I changed the look of the game a bit to make sure that those original 100 copies remain special. For this edition, the card backs and box now feature a dark background with some skull and crossbones instead of the original wood. I touched up a few spots in the rules as well that have drawn questions. The game, remains completely unchanged. I love this game. I am crazy proud of it and thankful that it’s been well received. I hope that someday it will find a publisher for a larger release, but I’m not going to be that publisher. I’m out of the Kickstarter game fort he foreseeable future… so until it finds a home, please help me bring this game to life by sharing the Game Crafter link on all your social media outlets. That would be swell.